Police bundle out man who refused to leave the hospital after 3 years. The crazy things people do at times. A 55-year-old man who refused to leave the hospital after three years has been forcefully ejected by police in Beijing, China. Chen received treatment at Beijing Jingmei Group Hospital in August 2011 after having an accident. He returned to the hospital months later after complaining of pains in his legs. He was diagnosed of deep vein thrombosis and treated for another three months. After the treatment he was certified okay and told to go home but he refused saying the hospital should be responsible for his welfare. He chained himself down to his bed even after the hospital took legal actions against him. 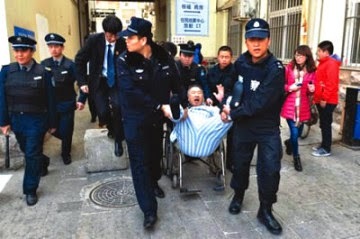 His insistence prompted the intervention of the police who cut the chain and bundled him out of the building. PreviousChelsea racist victim declines Mourinho’s invitation to Stamford Bridge. “Victory is in sight and within our reach”. Read full text of President Jonathan’s speech at handover note presentation.